Sony’s IP Disaster and Amazon’s Cloud Crash — Rough Times Ahead for Hosted Solutions and Data? It’s been a challenging few weeks for those dependent on the cloud, despite the continued stratospheric valuations of some companies embracing virtual deployment and network business models. Even though we’re not as likely to be impacted by Sony’s recent fiasco in the procurement and operations world, when hackers twice accessed millions of user records, including credit card numbers, birthdays, addresses and related personal profile information, our kids most certainly were (and I’m betting at least a few dozen Spend Matters readers had compromised credit card numbers as well). Still, no amount of planning will ever be enough to guarantee 100% uptime in an environment that is out of our control. Just as we can’t predict Black Swan events like the Japanese earthquake and tsunami which will have lasting supply chain effects measured in quarters, not months, or the recent tornado tragedies in Alabama which have shuttered numerous manufacturing facilities in addition to the loss of hundreds of lives, we’ll never be able to fully guarantee to our suppliers and stakeholders that any network-reliant technology — from supplier networks, to hosted P2P toolsets, to even email — will be foolproof. Even email can be affected — Google’s G-mail crash a few weeks back took our VP of Business Development and Spend Matters Contributor, William Busch, offline for a few days. Still, perhaps we shouldn’t be too worried, as we’ll no doubt work through the growing network pains of cloud models, provided we plan accordingly. I like what Purchasing Insight has to say on the subject: “Technology is notoriously fragile. If our cars were as unreliable as our PC’s we’d walk everywhere – so why were these organizations floundering when their cloud provider had a few issues? Did they not know that computers sometimes break? Risk management is a fundamental business discipline and procurement professionals should lead from the front in highlighting the critical importance of ensuring that contingency plans are in place. Whether setting up a shared service operation overseas, relying on a third party to manage invoices or adopting a cloud-based IT strategy — alternatives need to be in place to cater for the very predicable unpredictability of the real world. 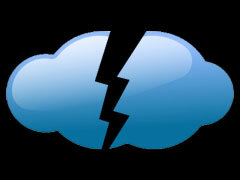 So what is your back-up plan for the cloud? And are you even worried? Granted, just as we’ll never go back to the days of holding large quantities of inventory on hand as an insurance policy against potential supply chain breakdowns, I have no doubt that the future of procurement and supply chain will continue to focus at the intersections of organizations, not just inside then. This necessitates network/cloud models for connectivity regardless of whether we want to buy software and install it on our servers or rely on partners to do it for us. Personally, I’ll be more cognizant of the risk of the cloud our own business depends on — and we’ll probably think of how to build greater redundancies into our business, sites and application offerings — but we’re certainly not going to take a step back.